One of the mainstays of advertising for online contact lens retailers is the promise of low prices and great deals. 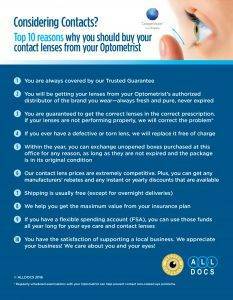 The claim is that you are unable to get the same low prices if you order from your optometrist. The offer sounds great, for sure, but ultimately proves to be quite false. The truth is, while the original price on some online sites may give the appearance of lower prices, the bottom-line often ends up costing you more than ordering from your eye doctor's office would have. Many eye doctors in Northeast Philadelphia, PA have the ability to redeem special rebates for their patients, allowing eye doctors to cut costs for you at the bottom-line. Online services are often unaware of these rebates or will ask their customers to redeem these rebates on their own. Many people will not know where or how to redeem these rebates, losing money they would have been able to save by buying in-office.